This is the sign that greets you when you enter the InterContinental The Clement hotel in Monterey, California. 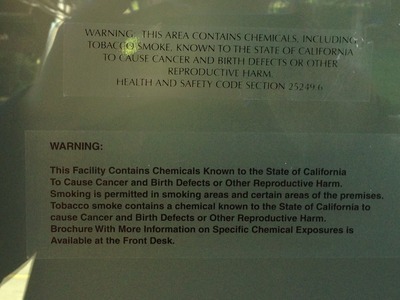 It warns that "This Facility Contains Chemicals Known to the State of California to Cause Cancer and Birth Defects and Other Reproductive Harm." Material in the guest rooms says it is a smoke-free hotel, and I didn't encounter any tobacco smoke, so it seems like another example of the state of California imposing alarmism about the possible health effects of tiny amounts of ordinary chemicals. I don't take the risk of cancer lightly, but really, if the state thinks that walking into this hotel causes cancer, birth defects, and reproductive harm, it should shut it down and send in workers in haz-mat suits to remediate the danger. Instead it posts these warning signs, which are so ridiculous that they are impossible to take seriously. What is a prospective hotel guest supposed to do upon encountering such a sign? Cancel his nonrefundable hotel reservation and drive to sleep in some other state with a more rational approach to regulation? Warning on door of InterContinental The Clement hotel, Monterey, California.